Besides supplying parts and assemblies for aerospace, appliance, automotive, building hardware, medical and other markets, Wisco Industries offers its own line of food-service equipment including pizza ovens and display cases. Tom Short operates a new all-electric press brake at Wisco Industries, Oregon, WI. The company employs eight electric and electric-hydraulic brakes, enabling faster, more accurate production with a significant drop in power consumption, as only the control draws power until a brake’s foot pedal is depressed. 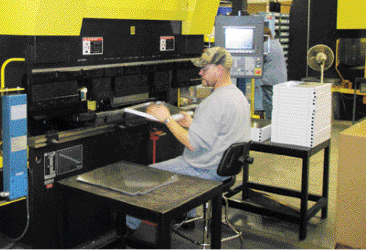 To accomplish all of that, the Oregon, WI, manufacturer employs a variety of stamping, fabricating and assembly equipment. The 140,000-sq.-ft. facility, with 160 employees working over two shifts, operates 26 mechanical presses in capacities from 38 to 330 tons, two automatically fed laser-cutting machines, automatically fed turret punch presses and a host of press brakes. Wisco’s Oregon operations are augmented by a 122,000-sq.-ft. assembly plant across town as well as a smaller stamping and fabricating operation in Cullman, AL, to supply customers in the South. Power Savings MC Machinery Systems, which markets Toyokoki press brakes, recently conducted a study at Midwest Products & Engineering (MPE), Milwaukee, WI, to meter the company’s press brakes when in idle mode—power on, but not cycling. MPE has three Toyokoki HYB hybrid electric-hydraulic press brakes, four Toyokoki APB electric brakes, and two conventional hydraulic brakes. Based on the data, the 60-ton conventional hydraulic press brake consumes six times more electricity than a 275-ton HYB in idle mode. Even with a busy press-brake schedule, MPE officials believe that a press-brake ram only cycles one-fifth of the time during a shift, making power usage when idling a significant issue for the company. The APB, a fully electric press brake, consumes virtually no power—only enough to run the control display—until an operator steps on the pedal. With no hydraulic pump, the brake uses no oil, thus requiring minimal maintenance. It features a ram repeatability of 0.00004 in. Because a direct-drive AC servo motor, which provides the APB’s pressing force, limits tonnage capabilities, Wisco operates the higher-tonnage electric-hydraulic hybrid HYB brakes. Unlike a conventional hydraulic press brake, oil flows on an HYB only when the foot pedal is actuated. This reduces power consumption by 50 percent or more as compared to hydraulic press brakes, according to officials from MC Machinery Systems. In fact, Wisco received a credit from its power supplier after verification of energy savings resulting from the new brakes. The HYB uses no solenoid valves or heat exchangers, and AC servo motors control oil flow rather than the valves used for ram positioning on conventional hydraulic brakes. That enables the HYBs to maintain constant velocity with positioning not dependent on oil temperature or viscosity, thus providing ±0.00012-in. ram-positioning accuracy. Wisco feeds its press brakes primarily thinner-gauge stainless-steel sheet, often preprocessed on the company’s laser cutters or turret-punch presses. And the APBs and HYBs turn the parts around quickly, thanks to automatic crowning, backgauging and thickness-sensing features. That capability has helped Wisco speed production and reduce inventory.